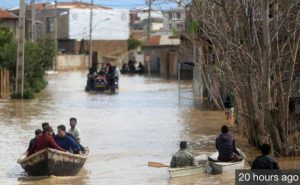 In the North of Iran, severe flooding is causing chaos and loss of life. The rains have been unprecedented for that area and much more is yet to come. Numbers of victims are still rising and new areas are still being affected. Our local partners have urgently requested supplies of food and water to provide for those that have been displaced. Our emergency fund is now open and we plan to start as soon as possible with distribution of essentials through our local partners. The situation in the country was already tense with widespread shortages and high inflation. The current events add to those tensions. Pray for stability and for all parties to focus on providing help for those hit by this disaster. Pray for emergency workers that are trying to rescue people. Pray for God’s strength and help with this difficult task. Pray for the hundreds of thousands of underground believers in Iran. May their love shine brightly in this dark time. And may God provide all their needs. Pray for comfort and strength for those grieving and injured. Pray our partners will be a blessing to them, both spiritually and materially. If you can, please give generously to the emergency fund below. Thank you!